Ah yes, your budget. Some organizations come to me with a magic number in mind while others aren't sure where to start. Even if you've been through the process before, there are always numerous variables (hourly rates, custom vs. template, etc.) that impact cost and can result in extreme ranges between web design agencies or developers. This often leaves customers feeling cheated or just confused. To bring some clarity, I have provided some high-level price ranges along with four considerations for developing your budget. *Warning: This is a long post. Budgets can be complicated and unpredictable. I have tried to provide a lot of detail in terms of how you can be best prepared when approaching an agency or developer. As mentioned above, the reason for the fluctuation between redesign costs, even with the same exact website are a combination of several factors. Each developer or web agency likely has different answers to each of these questions, which results in costs ranging from $500 - $100,000+. So to help provide a guide, I've outlined some general price ranges below. *Please keep in mind that these are very high level and there are always exceptions. Note that these price ranges do not include marketing, ongoing support or hosting services. Be sure to keep this in mind when searching for resources and always double check that your partner provides the additional services you need. Now that you have an idea of your top-level budget range, consider the following four factors below that can greatly impact your redesign budget. 5 -10 years ago, most pages on websites looked exactly the same, aside from content and photos. Subsequently, web agencies would estimate based on number of pages. Now, most websites have at least 3 unique page layouts that better accommodate different content and audience types. Whew! That seems like a little much doesn't it? But if you visit most law firm websites you can see that each of these general page templates look and function differently. This requires additional wireframing, design, development and content time for each – which ultimately increases the budget. Each unique page template you need can potentially add thousands of dollars to your budget. 2) Custom or off the shelf? When redesigning your kitchen you can either choose a custom cabinet or one that is mass produced. This is the same in regards to the functionality needed for your website. Sometimes there are plugins or systems that can handle what you need, while other times you need a custom solution. Along with content, underestimating the cost of functionality is one of the most common mistakes I see. Although there are thousands of plugins and systems, don't assume there is a solution available that will be a good fit for little to no cost. Also, don't forget to account for research, installation and configuration if using something pre-built. Unfortunately, content migration and / or production is the #1 item cut when a budget needs to be trimmed down. Even though we always remind customers content is the heart of a website, I can see why this happens; organizations usually assume content is one part of the process they can handle and have control over, so taking it on will reduce costs. While that can certainly help, I highly recommend budgeting extra for any redesign and never assume you should re-use existing content. Content Creation – copywriting, photography, video production, graphics, etc. Also, it's always best to get started early on content production. If you don't have most of the content complete by the time development wraps up, it can add weeks (if not months) to the overall timeline. This will cost you time and money. The most experienced agencies, designers and web developers typically have well-defined processes. They've seen it all when it comes to web design and know the potential challenges. Going with a well-oiled web design agency usually results in a more efficient project. This means that they are likely more productive per hour billed, which will save you money and likely gives you more bang for your buck. Most people look at hourly rates at face value, but the value really lies in the skill and effectiveness behind it. When it comes to timeline, we've found that the most efficient and successful projects have fairly aggressive timelines. For most redesigns, this typically means 6-12 weeks. Having a project keep consistent momentum – with both sides meeting deadlines – usually reduces overall cost and obviously, time spent. 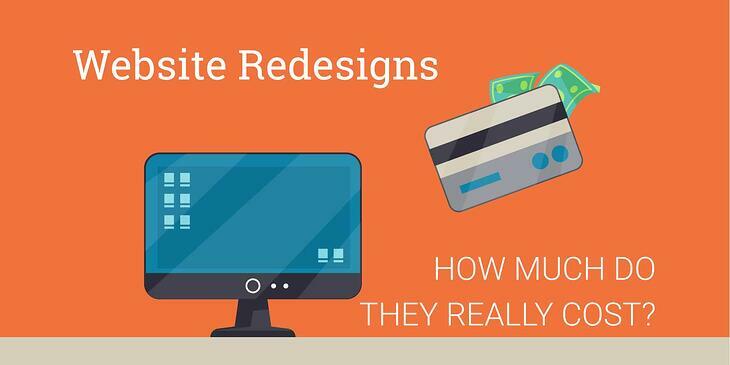 When trying to budget for your upcoming redesign, first consider what your high-level budget range is. This will help determine what types of resources or organizations you should approach for a bid. Then consider the potential number of page templates your site requires, the types of custom features, any content services you are interested in and the type of experience necessary for a successful project. Any good web developer or agency should then be able to help you accurately scope your project. If you are thinking about a redesign, check out our 25+ website redesign resources or contact us today.